By posting my Gold by Harlan Goldstein entry at this time, I am expected to be yelled at by H and S because we have been planning to come since early Dec 2010. What do I have to say about my rudeness? any excuses? 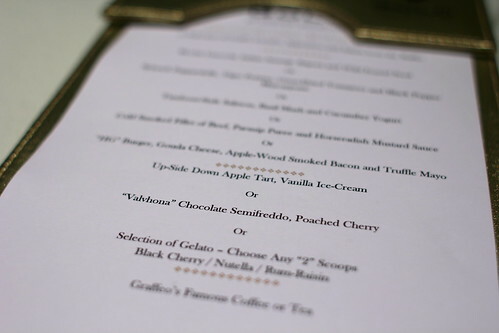 Well, (1) it was brunch that I tried so our upcoming "Golden" dinner at the end of Jan 2011 is still on! (2) as a gentleman that I am (*wink wink*), I have to do a quality assurance to ensure the upcoming experience would be a wonderful one! It was the least I can do to test it out first. (3) I wasn't detoxing HAHA. Hope H & S can forgive me for what I intended to do. 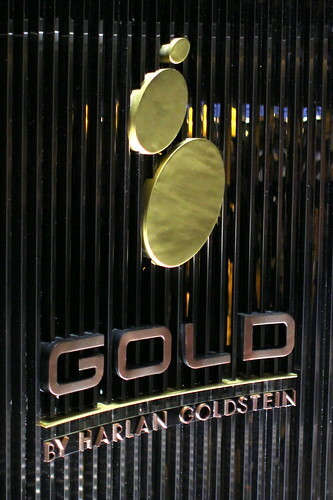 Harlan Goldstein should be a fairly familiar name for many local foodies and his name has been associated with many restaurants in Hong Kong whether he likes it or not unfortunately. Therefore, I should take this opportunity to clarify that Gold by Harlan Goldstein is the only one in Hong Kong that is under his helm, all others bearing his name are simply ... not. I read somewhere that he even said that "The only place you'll find the real Harlan now is at my new venture, Gold by Harlan Goldstein." Quite a bold statement by that just shows his confidence I assume? The following phrase I saw in one of the hanging pictures at Gold further reinforced my assumption: "Why go for Silver when you can go for Gold." Please note that Gold closes on Sunday until further notice. I bumped into Harlan himself on my way out and asked him about this. He said he wants all his whole team to have the same day off. I think it is quite a nice touch since the whole team can rest on the same day or perhaps organize some outdoor activities on the same day for team building or whatever. Alright, enough with the talk and let's get to the food! 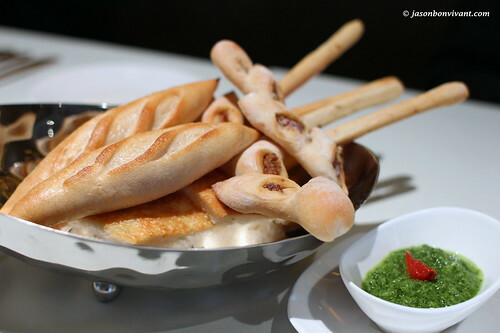 For lunch / brunch on a Saturday, part of the set lunch include a appetizer buffet. (I wonder if weekdays lunch the same applies?) Plenty of choices for lunch but I was more focused on the shrimps! I did mention I like shrimps right? 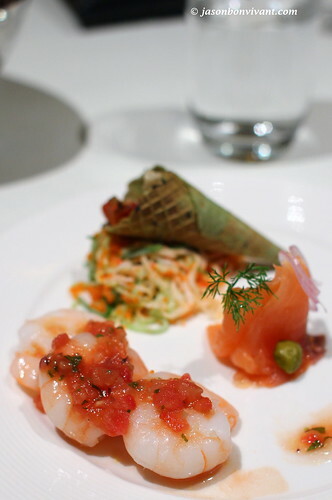 (The only down side of the appetizer buffet was the arrangement of the dishes. Some were placed on the circular bar top while some where on the another counter not meant to be serving buffet. I was quite certain the buffet appetizer offering was an idea thought of out after the renovation. 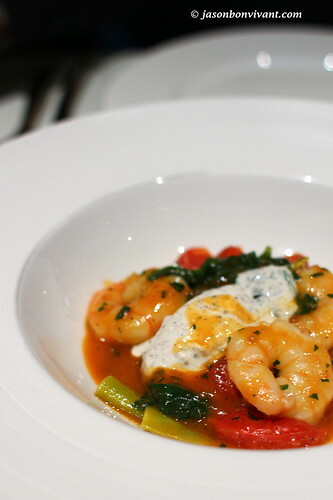 I did not get to try the Spinach Pappardelle, Tiger Prawns, Oven-Dried Tomatoes and Black Pepper Mascarpone, but L seemed to enjoyed it in general with a light comment that the tomato sauce was a bit too ... pungent? Cold Smoked Fillet of Beef, Parsnip Puree and Horseradish Mustard Sauce. I wasn't quite sure what it meant by Cold Smoked. After a quick lesson from Mr. Wiki, it is a method used to enhance the smoky flavor of the meat by "cold smoking" it under 38C for a certain period of time before cooking it. Very flavorful it was, not overly pungent as the color of the sauce appeared to be. The beef was moist and tender, quite an interesting combination of flavors in my opinion. 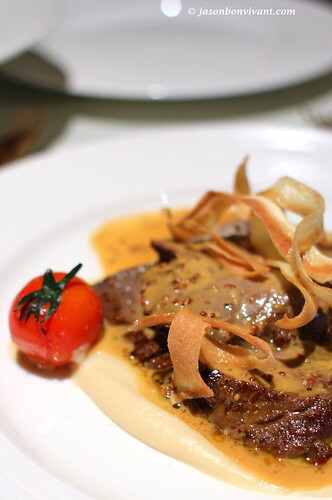 Although the sauce was not overly pungent, it was strong and rich enough to overpower the beef flavors though. 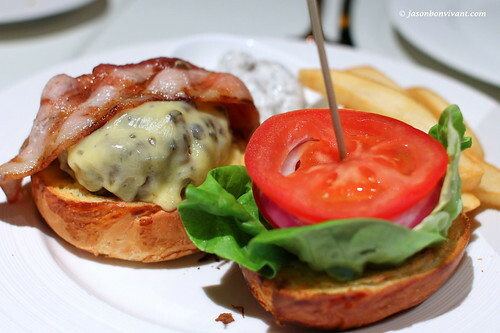 The HG Burger, Gouda Cheese, Apple-wood Smoked Bacon and Truffle Mayo. This is one of the signature dishes from Harlan himself and quite famous for it as well. I had it a long while ago at Harlan (IFC) but it did not "woah" me at that time nor this time. It was very hearty and tasty but the meat patty was a bit loose which proved that it was freshly handmade I suppose. Tougher patty would be nice. Ricotta Gnocchi, Italian Sausage Ragout and Wild Funnel Seed. I was quite shocked at first to find it so mushy and then I pondered for a minute because it cannot be the case that they overcooked it by that MUCH. I looked the the menu again and bingo, it was Ricotta Gnocchi that I was having, not the usual potato gnocchi hence the softer and more mushy texture to it. Quite interesting indeed! The Italian Sausage Ragout was a bit rich and strong flavour wise, slightly overpowered the hints of cheese flavors of the Gnocchi. 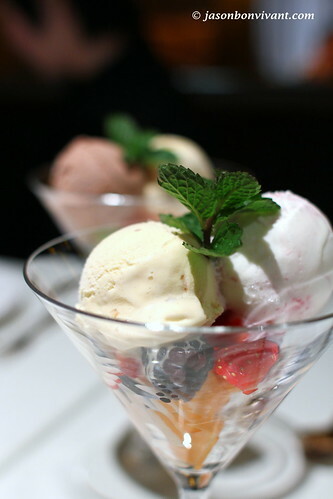 We started off with something simple, Rum-raisin and nutella Gelato. They were ... nice, especially the run-raisins one but rather boring. They should have offered the froyo on the set. Yes! They have a frozen yoghurt machine there and you are order yours spiked if you like. 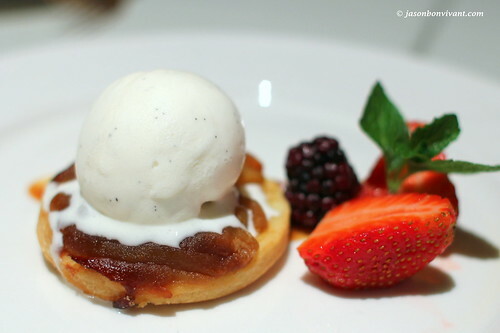 The upside-down apple tart was ... rather ordinary and not enough of an excitement for me. 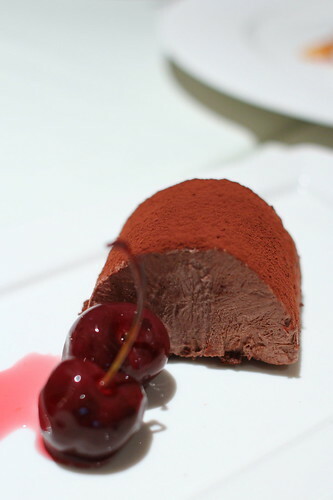 "Valvhona" Chocolate Semifreddo, Poached Cherry. Very rich. Since I did not get my froyo, I will get something at least semi-frozen! Semifreddo should be made of equal parts of ice cream (or gelato) and whipped creame but the texture seemed rather soft so perhaps more whipped cream here? In any case, I enjoyed it. Once again, sorry H and S but the good news is that Gold passed the QC so we are heading back soon! Thanks for checking out the place first? awwww ... You two are too welcome! :) ... I am going to try the slow cooked egg! 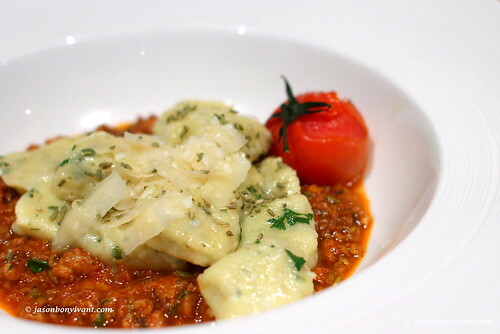 Ricotta Gnocchi, Italian Sausage Ragout and Wild Funnel Seed - I always like potato gnocchi for its texture but the Ricotta gnocchi was something new to me. Cold Smoked Fillet of Beef, Parsnip Puree and Horseradish Mustard Sauce - although slightly overpowering flavors from the sauce, it was rather refreshing and gave it a slight kick. HG Burger - beef patty slightly too loose. Maybe I should try it again soon? "(3) I wasn't detoxing HAHA. "